Digital Echo Processor IC PT2399 is using CMOS technology in audio purposes. 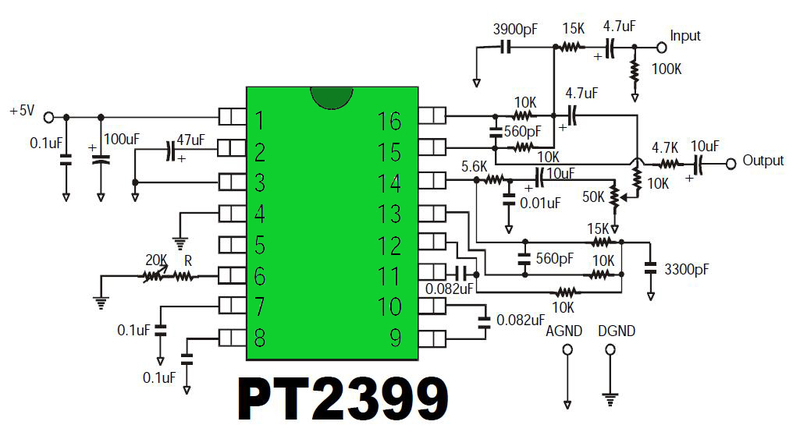 Digital Echo Processor PT2399 is implementing the system in the process of ADC and DAC audio repro echo. Digital Echo Processor PT2399 has a high sampling frequency and 44K memory. Digital Echo Processor PT2399 to repro echo digital audio system of repro VCO delay time system that can be arranged. Digital Echo Processor PT2399 has a very low audio distortion of (THD <0.5%) and very low noise as well (No <-90dBV) so that the Digital Echo Processor PT2399 is capable of providing good audio quality. Setting the external resistor from 10 K Ohm to 50 K Ohm. If the value is greater then the Delay Time also increases.